Engine: 1967 Harley Davidson. Panhead, shovelhead. 30 over s&s carb, andrews “a” grind cam. Chain drive final. Frame: tvc custom, hardtail trike. 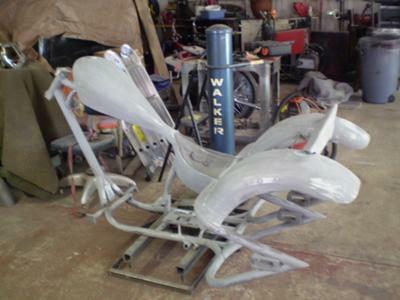 Frame, fuel tank, oil tank, rear fenders, all molded to be one piece. Front forks 58mm inverted 12” over. Flht 4 piston rear brakes. Stainless steel fuel and oil lines. Wiring and oil lines are hidden as much as possible-routed in frame. Color: tangeglow pearl. clearm 10 coats, 1.25 gallons. 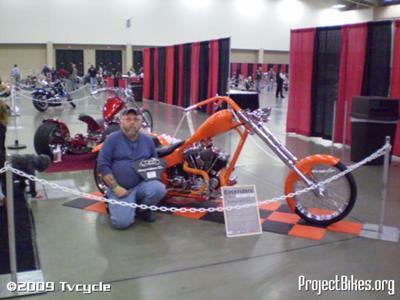 That is a piece of art.Could you make up a set of plans for a "Fatboy" Frame, that I could buy from you? 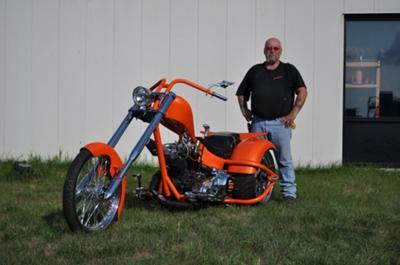 I lost a leg back in 02, and have been wanting to build a Trike but haven't seen any that I really liked the look of until now. If you can,post back up on here and let me know. Thanks. Join in and write your own page! It's easy to do. How? 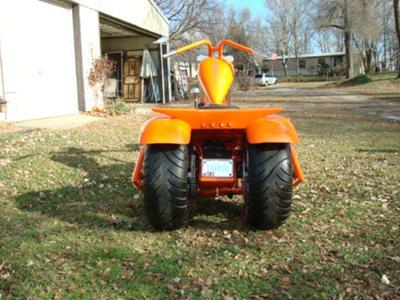 Simply click here to return to Trike Bikes.